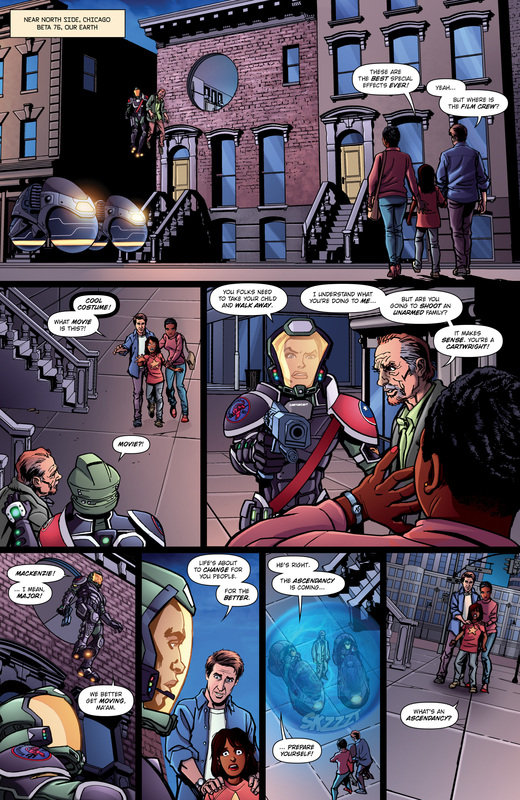 After nine months of working in relative silence on this project, my new science fiction adventure comic book series with FutureDude Entertainment is almost available! Finally I can share some of it with the world! 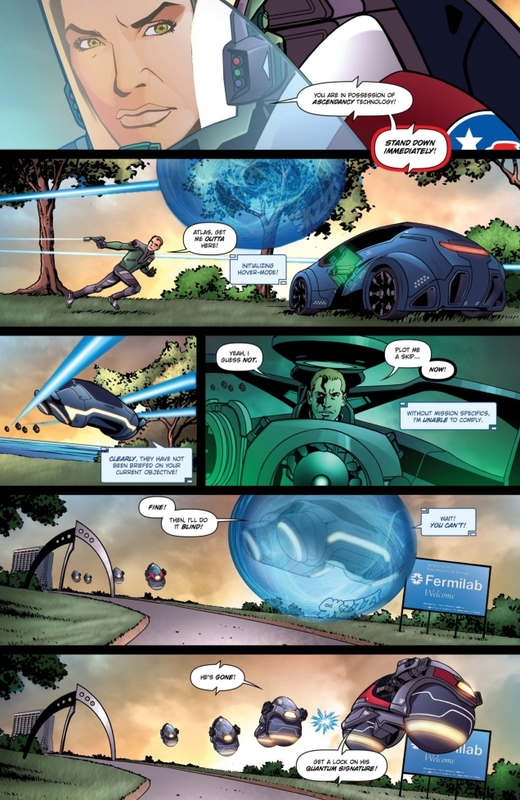 Here’s a preview of Parallel Man: Invasion America #1 and some more information about the world and story. 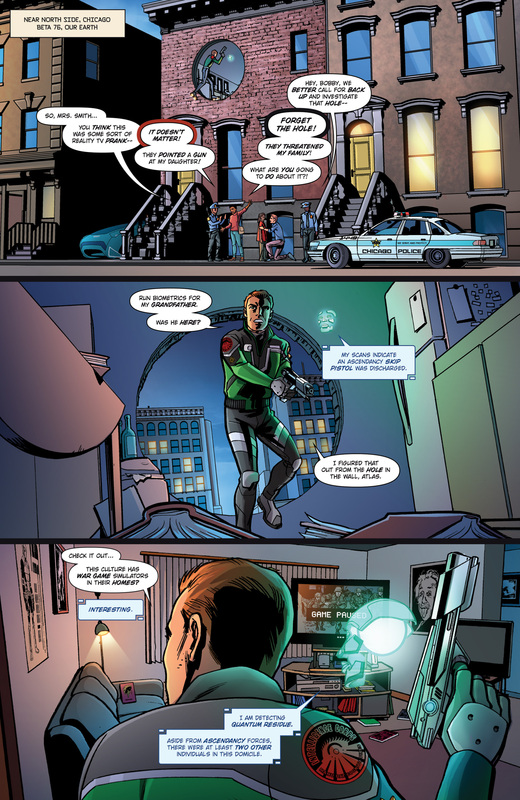 The story of Parallel Man follows Commander Nick Morgan — an intelligence agent from an evil version of America in an alternate universe. 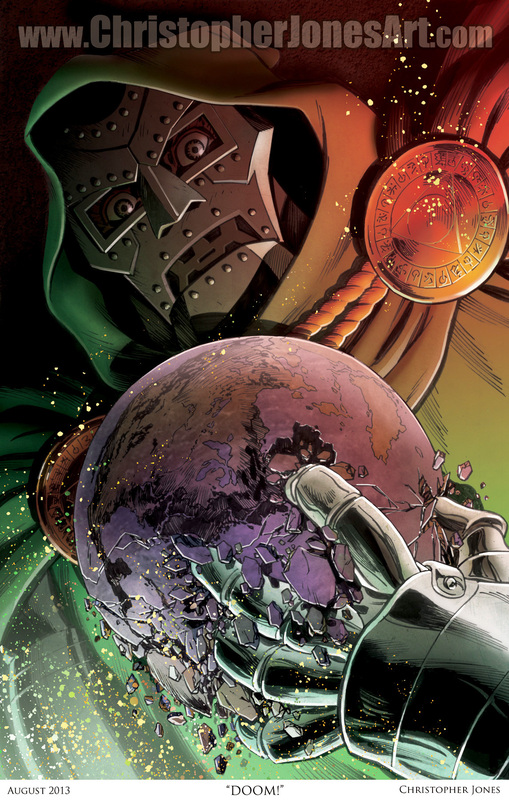 His government, known as The Ascendancy, has attacked and enslaved eleven other Earths and has its sights set on our world as their next target for their empire. Nick spent his childhood secretly learning of the freedom in other Americas from his grandfather, Tobias Morgan, and struggles to fulfill the deadly goals of his leaders. 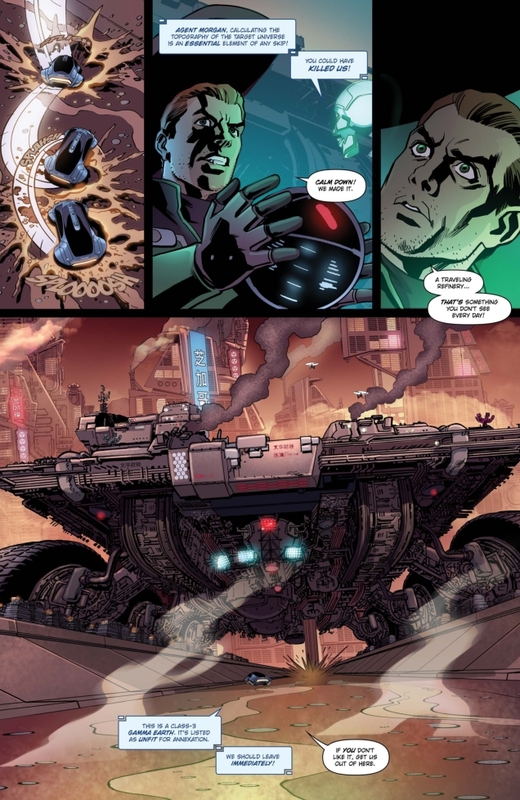 Now, after stealing an advanced vehicle prototype and his A.I. 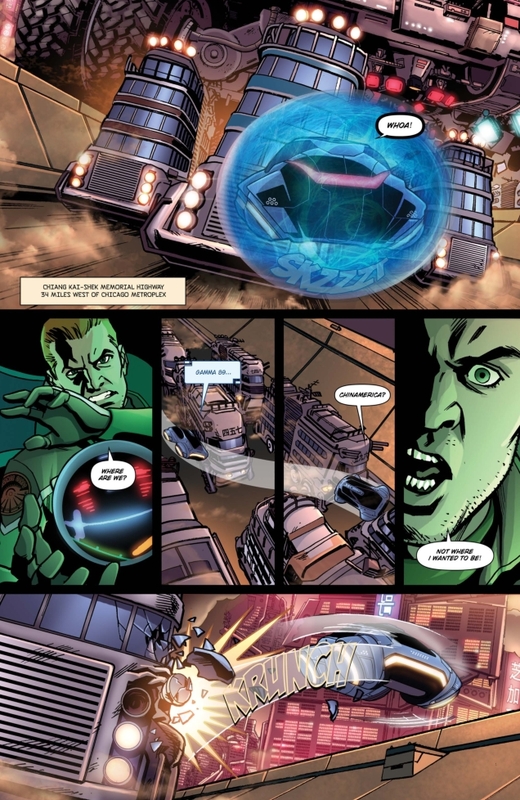 companion Atlas, Nick seeks out the leaders of a former rebellion known as The Futurists (led by a parallel universe version of Dr. Carl Sagan) for their assistance in assembling a legendary weapon that could stop the Ascendancy forever. 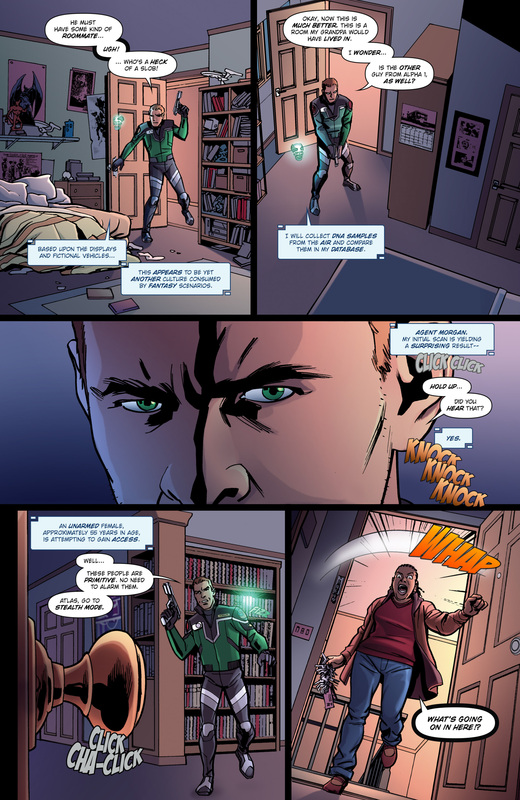 Nick is pursued by Mackenzie Cartwright, daughter of the president and commander of the all-black Hellfighters Squad in the segregated Ascendancy military. Her motives are complex. 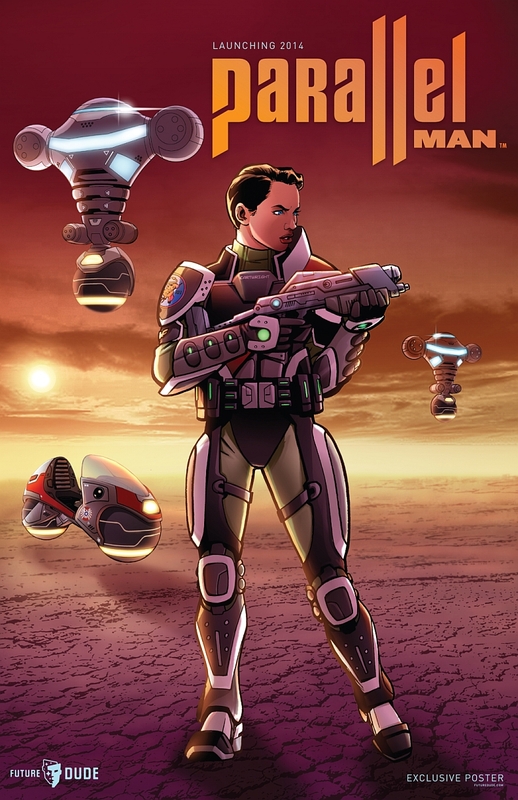 She is loyal to the Ascendancy, but the culture of her home world is not friendly to her ambitions for power or her relationship with Captain Glenn Douglass, one of the soldiers under her command. 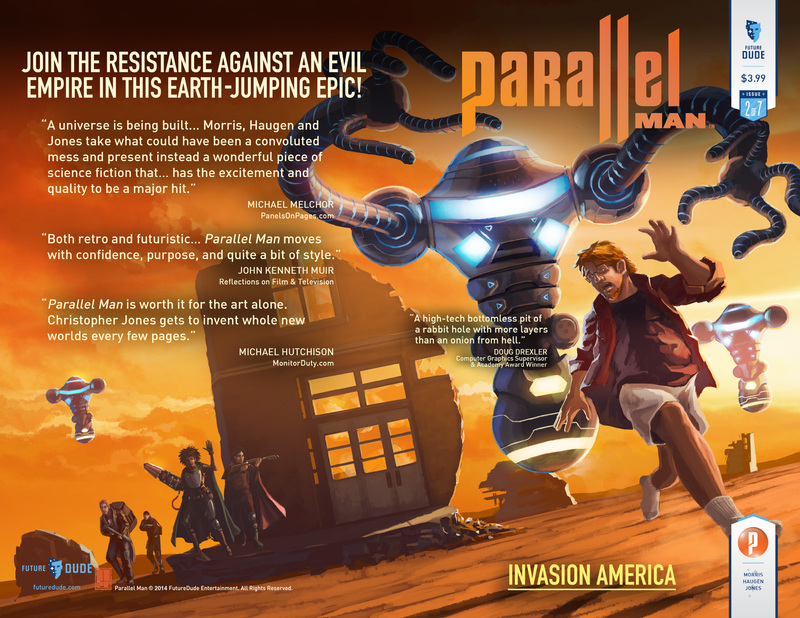 Parallel Man: Invasion America is exciting, the world is immense, the characters are interesting. 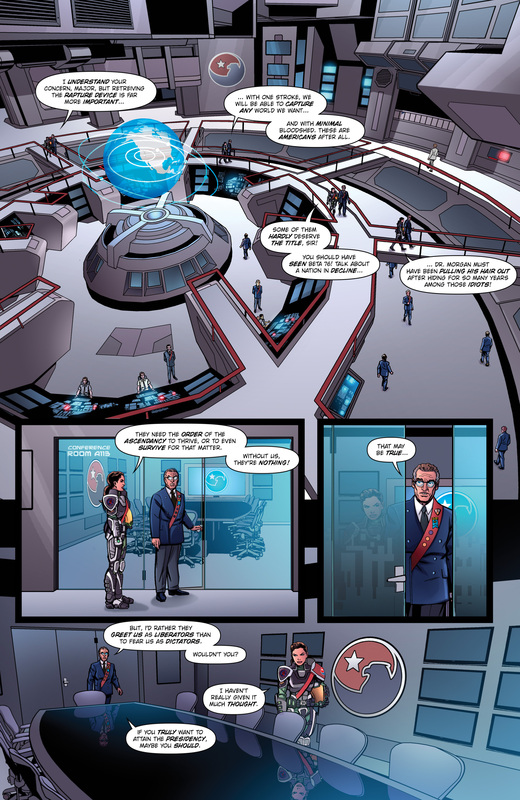 Like any good science fiction, it touches on some what-ifs that I think will help promote interesting discussion. 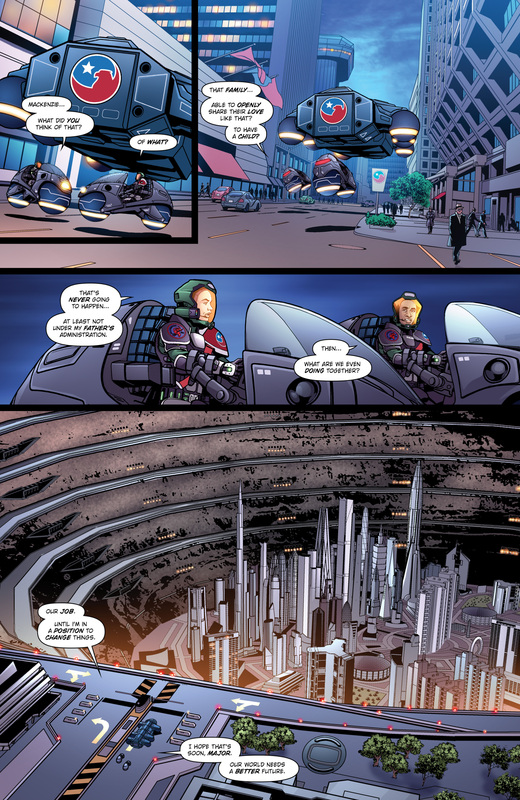 (For instance, the Ascendancy is a parallel universe in which the civil rights movements never happened.) 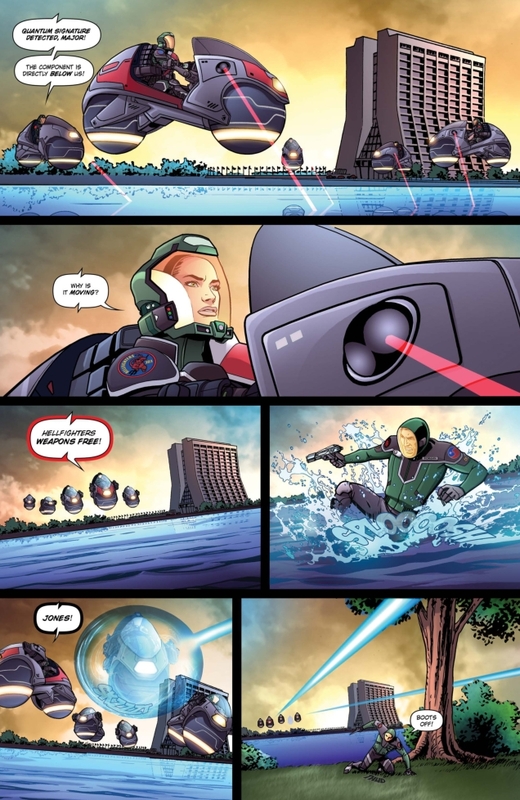 Overall, the tone is pro-science, pro-scientist, anti-imperialist, and a fun adventure that explores power, resistance and the costs of freedom. 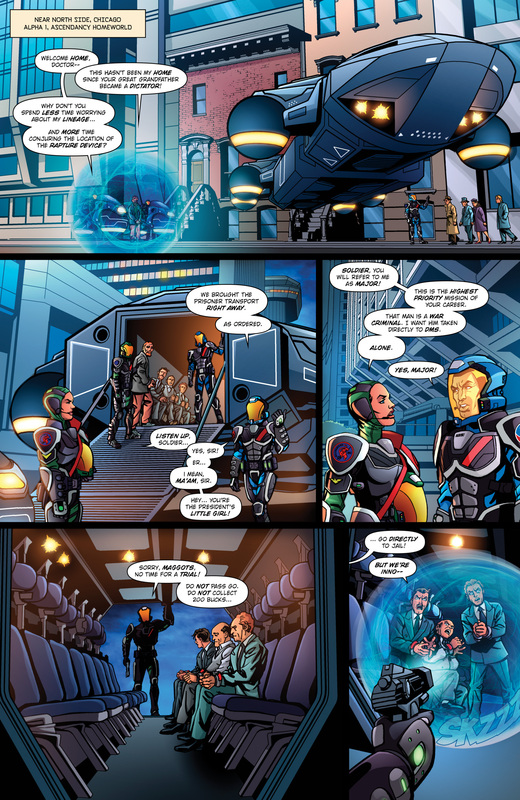 Young Justice comics fans will be interested to know that not only is the art by me, but it is colored by Zac Atkinson, who was the colorist on the Young Justice comic books. 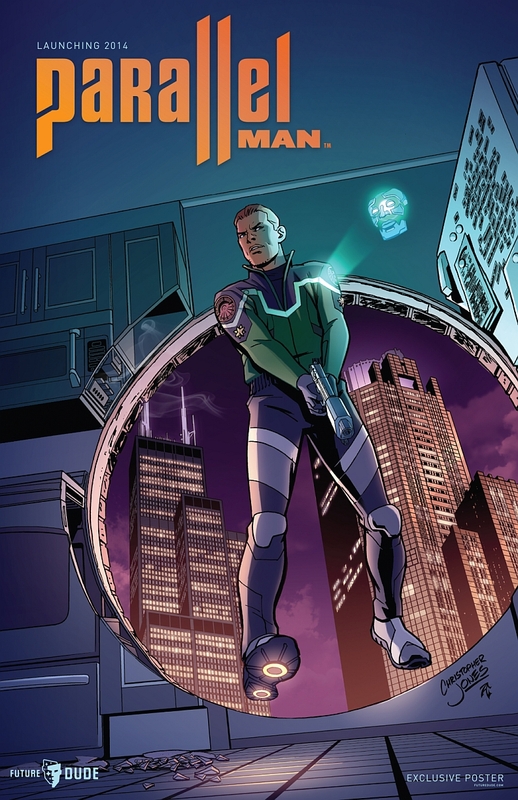 Parallel Man: Invasion America #1 hits shelves in comic book stores nationwide on October 8, 2014! You should pre-order it! Really. 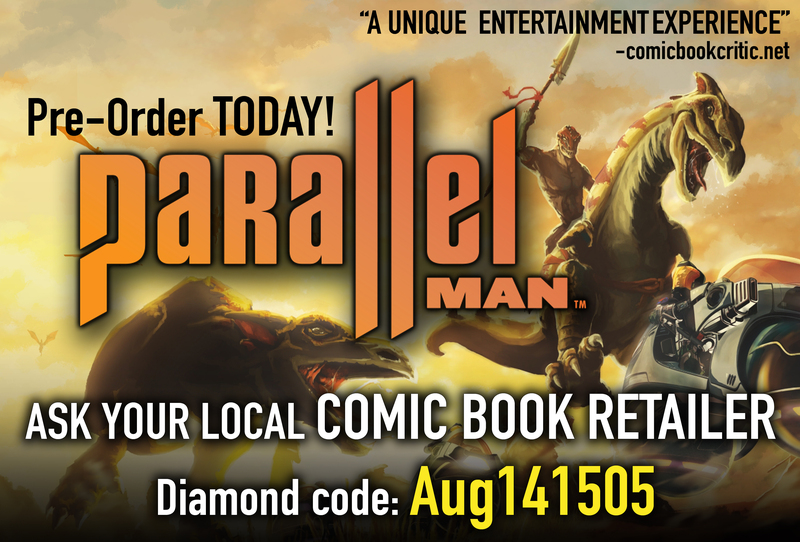 Add Parallel Man: Invasion America to your pull list with Diamond code Aug141505! 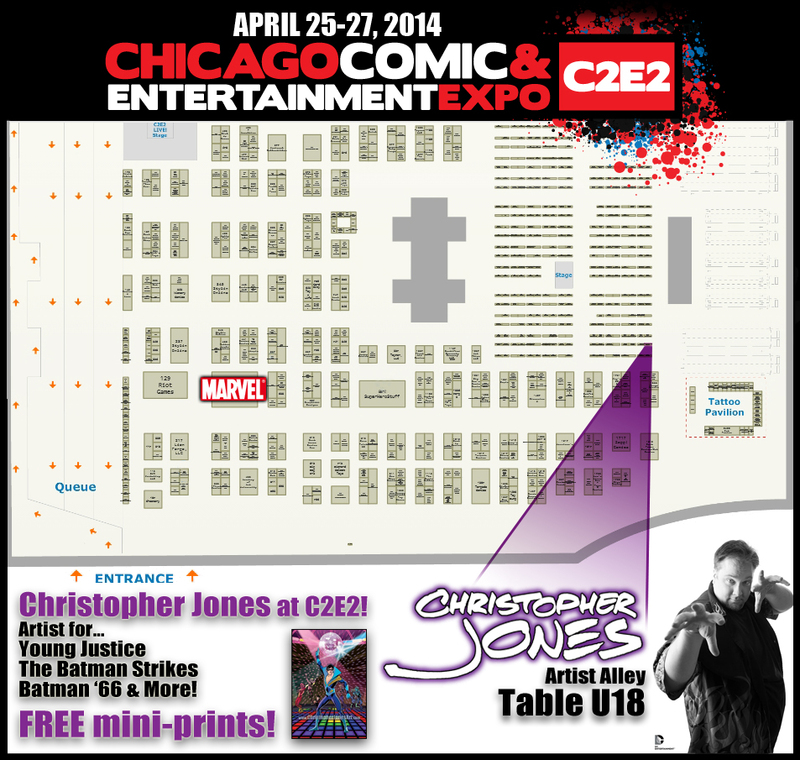 Christopher Jones’ C2E2 2014 Schedule & More! 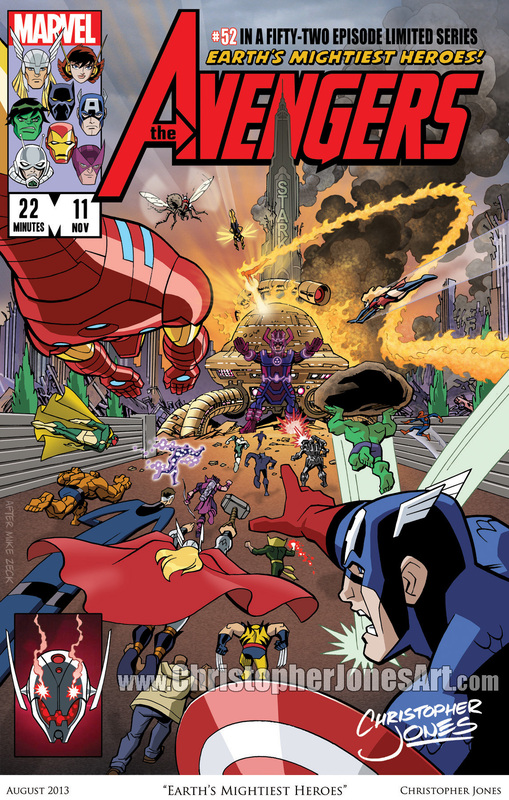 I am currently packing for my annual visit to Chicago – a strong contender for my favorite city of all time – and very excited to see the C2E2 crowd again! It really is a great show for comics fans and I look forward to every year. I will be at table U18 in Artist Alley most of the time, but I do have some other events & signings going on! Watch me draw LIVE on a BIG screen in the middle of Artist Alley! Come check out my new project & get a free signed poster! Come check out my new project & get a free poster or quick head sketch! 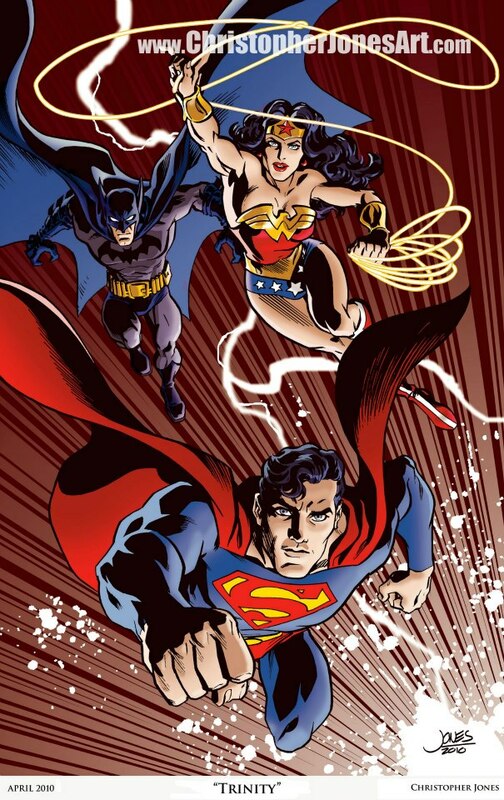 7:15pm – 8:00pm C2E2 2014 Young Justice Meet-up!! 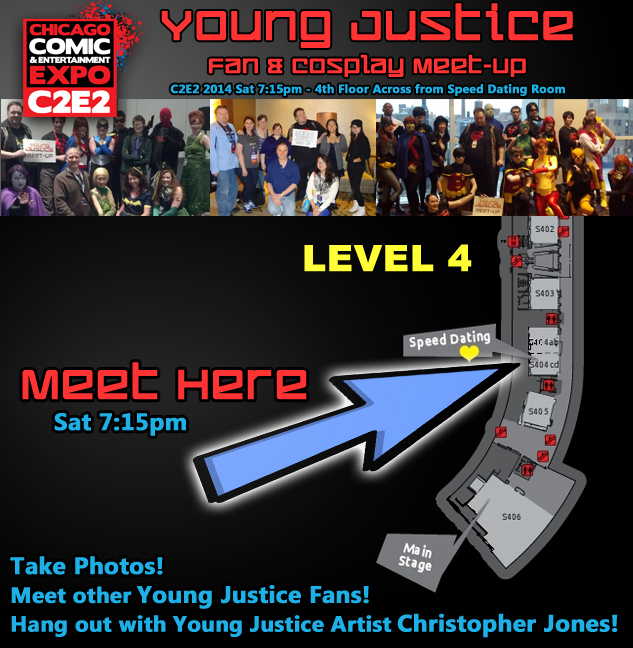 Meet other Young Justice fans at C2E2, take some photos, just hang out and talk Young Justice! SYMBIOSI! I may not be present for this depending on how tired I am at the end of the weekend. But I do have a sketch up for auction! 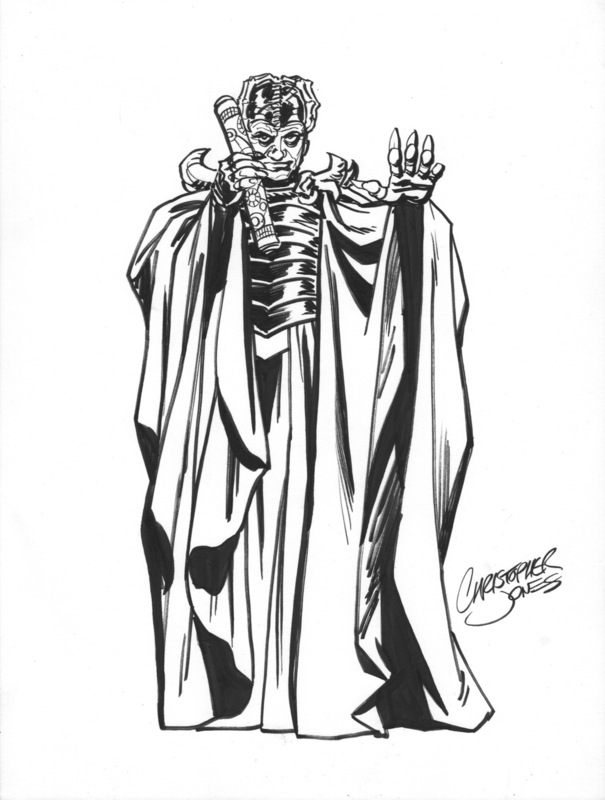 The sketch is of the “Evil Genius” character from Time Bandits, a movie everyone should see. It is ink on paper. Either way, go ahead and bid on some art – all proceeds benefit St. Jude’s Children’s Research Hospital! I’ll have all my Young Justice & comics 11×17″ prints available at my Artist Alley table, including a new Artemis Crock and Wally West print aptly titled, “Spitfire”. Prints are $20/ea or 3 for $50, which is a significant discount from my Etsy store. 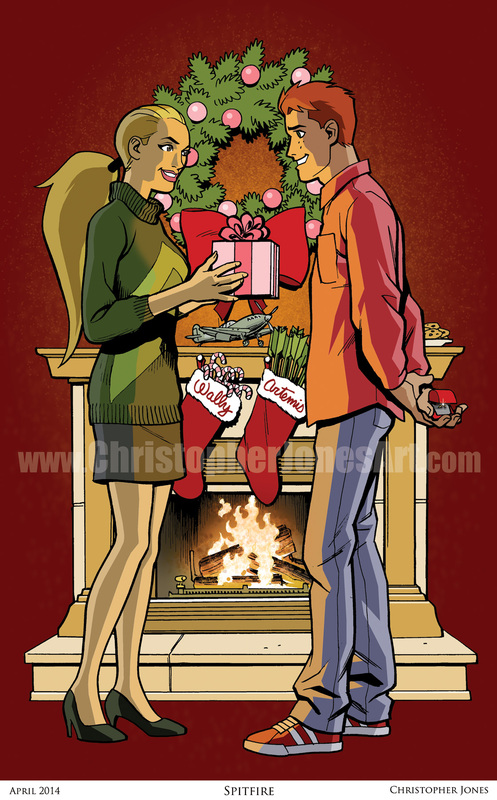 I’ll also have some smaller, black & white prints for $5, including a Young Justice and a Batman ’66 print. As far as comics, I’ll have some Young Justice: Invasion Trade Paperbacks for $15 and I may bring a box of The Batman Strikes! comics… we’ll see. Signatures are ALWAYS free, so feel free to bring stuff for me to sign. 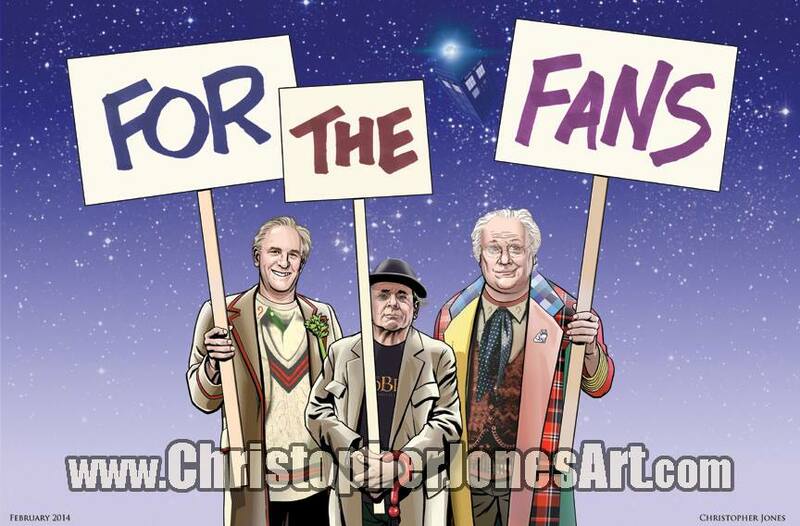 Classic Doctor Who fans may be interested in picking up my new-in-2014 print, “For the Fans”, based on Peter Davidson’s fantastic 50th Anniversary special, “The Five(ish) Doctors Reboot“. This will be the first comic convention I’ll have it at! 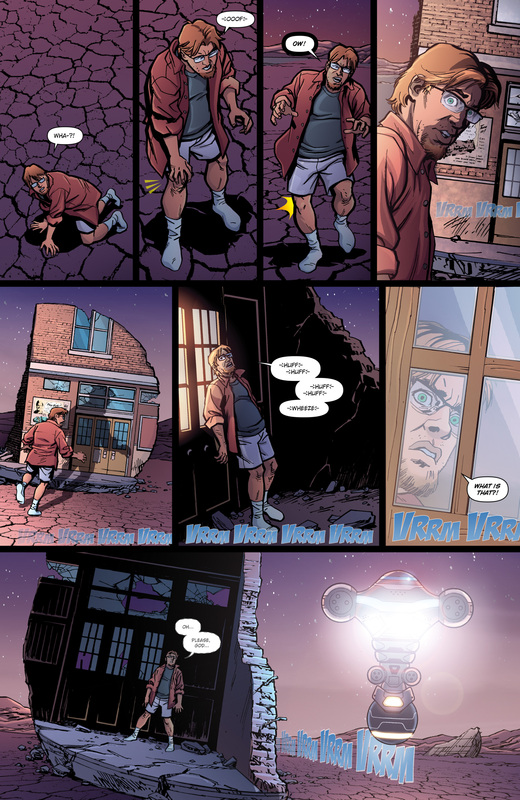 And of course I’ll have all my other Doctor Who prints, too. I should also mention that, per usual, I will also have some healthy snacks available free for fans at my Artist Alley table. They are granola & fruit bars. They are completely safe and definitely are not made by Lexcorp. But I know conventions can get expensive and it can be hard to eat healthy at the food court, so if you need an energy boost, just stop by and ask me. However, my sketch list fills up FAST at conventions, so the earlier you bring me your request, the better. I debuted my very popular “Disco Nightwing” free mini-print at C2E2 2013, so it seemed fitting to debut a NEW free mini-print at C2E2 2014! Presenting “Fastest Man Alive”! 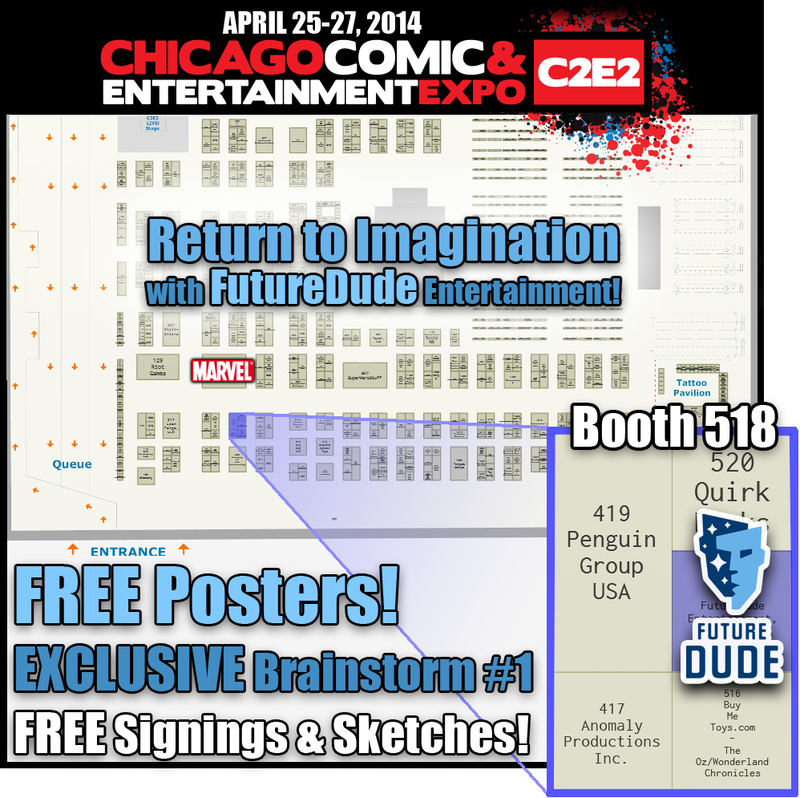 Visit me at C2E2 or any other convention in 2014 to get your own free signed copy! 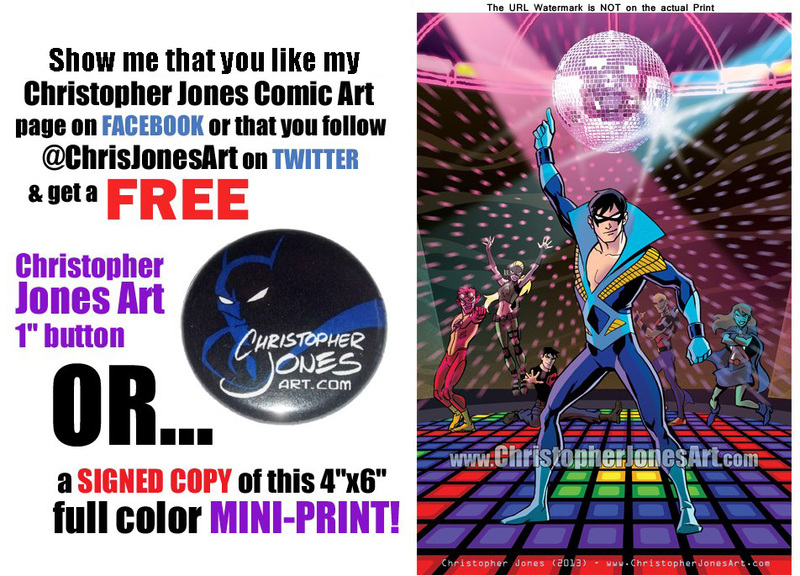 Don’t worry – I’ll still have Disco Nightwing mini-prints and Christopher Jones Art buttons available free at least through the rest of 2014! 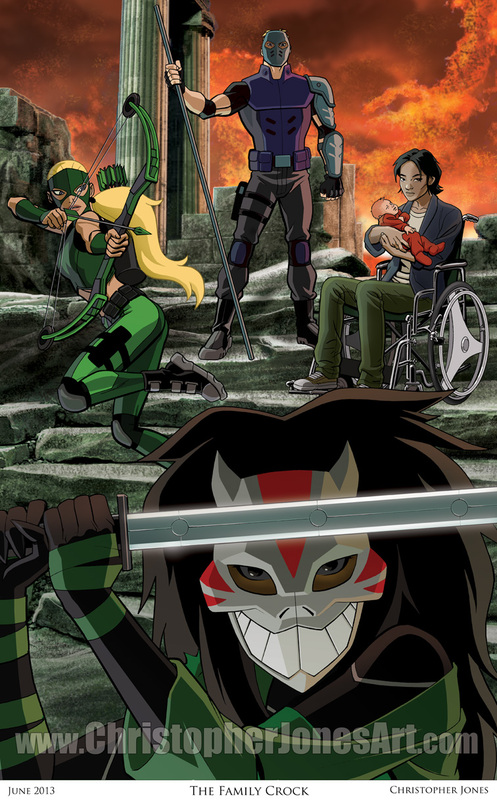 Greg Weisman and I have been organizing a little guerrilla programming in the form of Young Justice Meet-Ups at as many conventions as we can – we know the Young Justice fandom is still alive and kicking! So… want to meet other Chicago area Young Justice fans? Take some cosplay photos? Just hang out for a while with me and talk Young Justice? Come to the hall across from the Speed Dating room on Saturday at 7:15pm! See you there! SYMBIOSI! 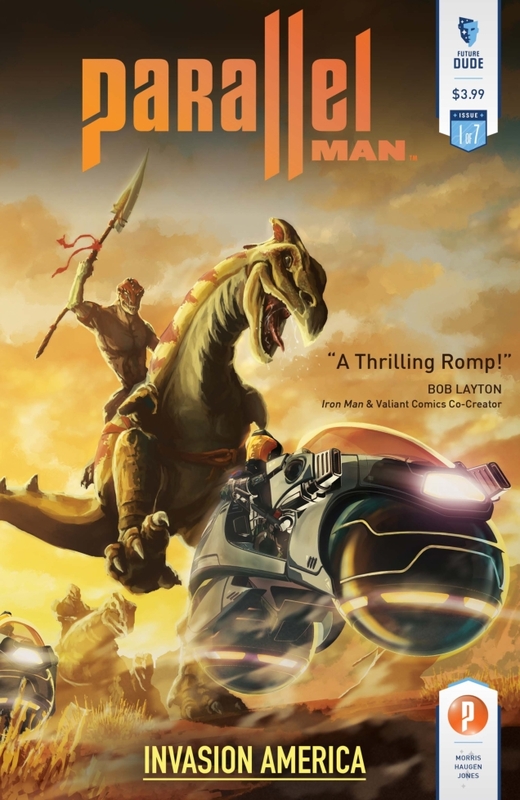 FutureDude Entertainment, publishers of “Parallel Man” (the new sci-fi action-adventure project I’ve been working on this year,) will have an Exhibitor booth and they will be giving away all kinds of goodies! 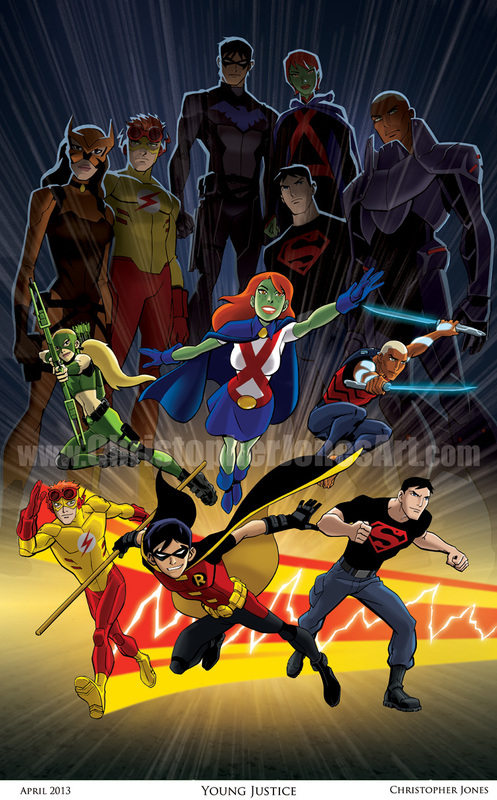 Including FREE 11×17″ posters featuring my art and colored by Young Justice colorist, Zac Atkinson! Well, I think that about covers it. I had better get back to packing! See you at C2E2! 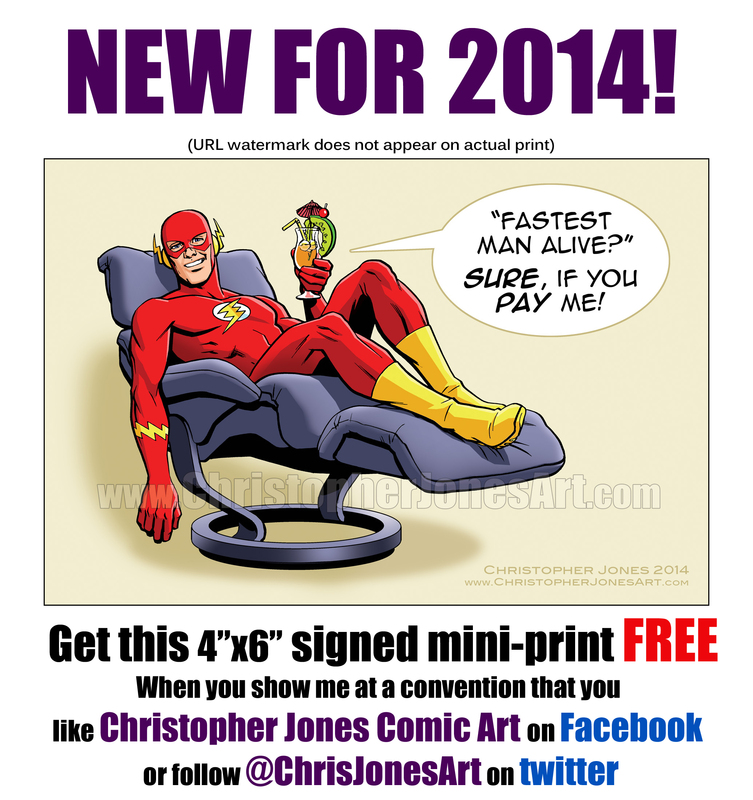 Conventions | Christopher Jones | April 23, 2014 12:05 am | Comments Off on Christopher Jones’ C2E2 2014 Schedule & More!